Right now my true identity is that I am a proud mother of two unbelievably precious girls, one is 6 and the other one is 2 years of age. I started blogging after we moved to Belgium from the States in the summer of 2011. I was a high-school teacher in Portland, OR. In addition to my passion for health science, culture, religion, and history, I love writing. For that reason, I wanted to share my unique experiences of living abroad in Europe through blogging. My husband is a fanatic when it comes to traveling. The hassle of making journeys with a stroller, a diaper bag, and baby foods didn’t stop us from going around the world. Who doesn’t like visiting a new country or learning about a new culture? But making the plans takes a little effort. Hope my posts and pages will help the future travelers to plan their trips better. The above writing is about three years old when we first moved to Belgium…didn’t want to replace it by my current situation. I wanted to leave it there because it was then when I grew my passion for blogging and photography. Now we are back in our home in Oregon. Life is not the same when we used to live here three years ago. Every part of me wants to go back to Europe and see the unseen cultures, places, and heritage of that continent. The best part of being back is being closer to my family and friends. I hope to go back to Europe again and follow our previous footsteps when our girls grow up, want to show them where we once lived, their school, some of the places we went with them and everything else. For now we are exploring our surroundings and our beautiful state of Oregon. Thanks for visiting my site. Don’t forget to subscribe and leave comments. I live in Europe. I stayed in New York for a month, in 2014 and I fall in love with this city. I hope one day to come back in the USA. Lovely blog! Look forward to reading many of your posts; thanks for stopping by mine! This is the first time I read this and if i look at the list of blog post’s you’ve made, I pray to God for me to create a sort of the same list. I hope I’ll manage! Though im 14, almost 15 so I’m lucky with the countries I’ve already visited. It’s a great inspiration though!!! Thanks for checking out one of my blog posts. I’m glad I found your blog that way, I loved reading your post about Costa Rica (my husband and I were contemplating to go there last feb, but decided on Argentina/Brasil last minute). Have a great weekend! Hello Globe Runner! I’ve decided to read and follow 10 interesting and new blogs a day every day of May 2015, and yours is today’s #5! Feel free to come visit me when you can at http://www.thatssojacob.wordpress.com, and follow if you like what you read. Happy blogging! Wow! What a life you live. 😀 I am so glad to have found you here. Oh my goodness! I am so honored you visited Ruby on Tuesday. Your photographs are just beautiful and so artistic. I am not a professional photographer or anywhere near that in skill. Again thank you. So nice to meet a Globe Runner! A blessing to have seen the world over. I have only just begun my journey and would hope to see as much before I start a family of my own. Cheers nice blog! We love traveling as well. 🙂 You have an awesome blog. Thanks for taking time to pop by mine. Hi, just sampled your blog. I really like that you travel with kids. It provides such an interesting perspective. It reminded me of a speech I gave about travel. “One of the mistakes businessmen make when traveling internationally is they forget to bring their toddler with them.” Hope you enjoy. An incredible list of travels lady.. and good for you to do it with kids. My own daughters are amazing travelers as well. Though we were not able to start until they were much older. Feel free to drop into Kathmandu. I have had about 3 stop in guests so far. Have about a year left here and then off to…??? Thank you and Cheers Back!! very nice blog. you’re so lucky to travel all those places. I also have a one-year-old boy and that didn’t stop us also in exploring places. Cheers! After you liked my post, I went to your page and the first post was about Edinburgh- I was just there a month ago and loved it! It’s really inspiring to read about a whole family traveling together. I look forward to reading more of your posts. Thank you so much for linking my page to yours. That’s so nice. I really like the fact that we have many things in common. We have families, we are both teachers, we like to write, and we love travelling. It couldn’t get any better than that. As you live on the Continent, I sure hope that we get to meet some day! wow, your blog is amazing! Thanks for visit and like on my blog. i hope you will return again soon and often! Namaste. . . .
Good for you – I think that’s so important! I didn’t travel till my early twenties after I had finished college, and I remember thinking how much more I would have gotten out of my education if I had traveled first. It just gives you such a different perception of the world, and what is out there. Your kids are lucky to have parents who are so adventurous! Thanks for stopping by my blog. Your overseas travels are good for those traveling with diaper bags. Appreciate your educating others! Hi, thanks for visiting my blog and for liking my post! Linda. The photo of you and your kids is lovely: a gorgeous family. I looked at your blog cos you gave a ‘Like’to my first ever blog post. And I am so impressed at all the places you have visited with such young children- it can be tough and tiring.But good planning helps a lot. your children are at a lovely age.Actually every age is great. What a great blog you have! I love it. It’s fantastic that you’ve been to so many places – thanks for sharing. I am hoping to visit Belgium someday – so I’m really enjoying all your pictures and notes. Thanks for visiting my blog, hope you’ll visit again. Hey thanks for the like! Excited to read about a fellow traveler! Thank you for liking my blog post. I look forward to reading about your travels as well. Love the picture on the Spanish Steps! Thanks for stopping by my blog! Hi there – I remember well travelling with babies – and the dirty nappies in the car boot! and how the customs guards were not impressed by my small son’s plastic gun! thanks for stopping by my blog. Come again! Thanks for liking my latest post about China. I am so pleased you did as I’ve discovered yours and its so inspirational and interesting! Brilliant blog. I am now following and look forward to reading more about your travels. Welcome! Happy weekend. Sobai bhalo thakben. I don’t know if I’ll be lucky like you to travel around the globe. Your blogs might be as close as I can go regarding travels. You are my inspiration for travelling with kids and I admire you for doing that. Lolzz…thanks Tithi. I know you guys love traveling…if there is a will there is a way…that’s what I believe now. Thanks for checking out my blog! I love all the info on your site. It’s always so fun to see what other expats are up to! So glad you dropped in on my blog. Thanks. We got our children travelling at a young age too. Such a great education. Thanks for dropping by “Honey.” We went overseas to Germany when our kids were one and three. My first visit to your blog took me to the Palace of Versailles. Great pictures. I showed them to my daughter who turned 25 today and will be returning to see the Palace within a couple of months. Her dream is to get a job there! Best wishes from the west coast of Canada, Jim. Palace of Versailles is a magical place, went there twice…love it. Thanks for your visit Jim. Thanks for stopping by, you’ve got a great blog yourself. Thank you for the like on my article “We are proud to announce…” I like the style of your blog. Keep up the good work. Thanks for liking my Mississippi post! 🙂 Happy travels! Its little different from other awards. Read the rules and see my post carefully. Gudday! Loving your blog. If you ever want to reach a new audience, come over to http://www.SayGudday.com and do some blogging there. We’d love to have you. Thanks for stopping by my blog, “Snapshots.” You have created a beautiful blog. I look forward to visiting often to read your commentary on so many interesting places. Thanks for stopping by Charles, please do come back. You have a great blog too, keep it up. Thanks for liking my post on the Very Inspiring Blogger Award. I hope you have time to browse through my recipes and try out some of the recipes some time. Please let me know what you think of them. Thanks so much for visiting my blog today and liking “Mums Bloom”. 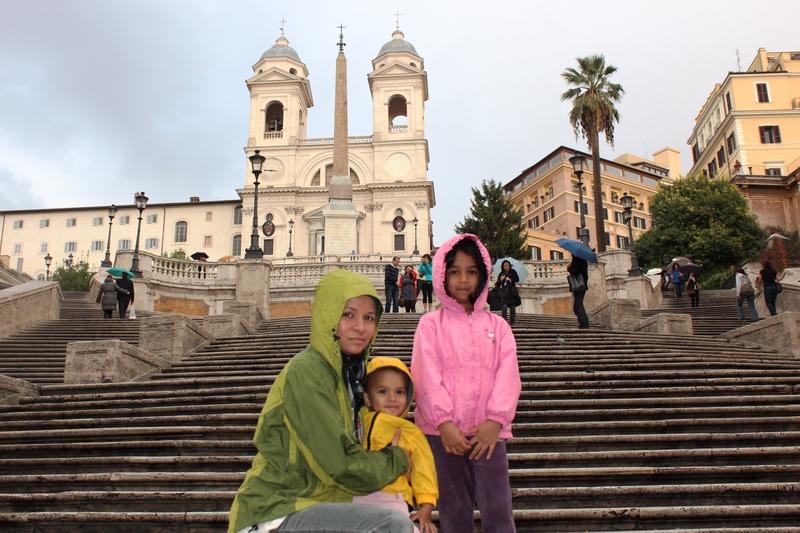 I enjoyed the photo of you and your daughters on the Spanish Steps in Rome. I have very good memories about those steps. A very beautiful place. Thanks for stopping by Robyn. Yeh, thats a lil part of some great memories in Rome. Hello there! Due to my husband’s work with IMEC, we are moving to Tervuren in a few weeks. My 6year old will attend the International School in Brussels. We should connect and I can grill you for expat advice:) lesley.england@gmail.com. Take care. Cool blog and photos. Glad I found it. Thanks for stopping by my site. Thank you for stopping by my blog. I like your multiple interests and the love for writing. Enjoyed your helpful post. Will be in Belgium ( Bruges, Flanders) in a few weeks via the Gorillas in Uganda. PS I’m Grandma x 4 now but have been there with the diapers ETC long ago. Good for you. It’s worth it. Wow, I have been to Bruge but very briefly. Hope you enjoy your trip here. And thanks for visiting my blog. Decided to check out your blog after earning a ‘like’ from you for one of my post, and glad I am to click on the link! I love the pictures and will be following your posts from now on. Wow girl! You sure do get around. Thanks for stopping by my blog and the “Like” for “Days Gone By”. Thanks for the Like. Great travelers think alike! I came across your site http://journeyaroundtheglobe.com while browsing some travel sites. I must say you are doing a commendable job. I have been following you for quite some time. I am impressed by the initiative you are taking.. Thanks for visiting our blog and liking my post. You seem to be having a wonderful time, and it will be an amazing experience for your girls. I travelled with my family when I was 11 and it was incredible. I’m really glad we are taking this trip now, just the two of us, but I hope we will also take our children travelling one day (or many days, to many different places!). What a nice story! One day when I have a family, I hope I will still have the courage to travel as well. Proud of you guys! Carry on this spirit. As i love travelling, i also collect travel magazine featuring the new country to travel.